Florida Gators interim head coach and defensive coordinator D.J. Durkin met with the media on Thursday to discuss the early portion pf practice ahead of the 2015 Birmingham Bowl, injuries, roster developments and the team’s preparation for the East Carolina Pirates. 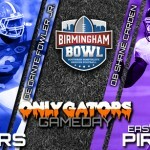 Florida and ECU will square off on Saturday, Jan. 3 at 12 p.m. at Legion Field in Birmingham, Alabama. Redshirt sophomore defensive end Bryan Cox Jr. began to show some flashes as the 2014 season came to a close, but he will be unable to take advantage of the 20 bowl practices to take his game to the next level ahead of spring practice. Cox, who announced on social media that he underwent surgery, has officially been ruled out for the bowl game after having a procedure on his hip. In his second year of on-field action, Cox finished with 29 tackles (six for lost yardage) and four sacks. He will likely step into a starting role with the Gators in 2015. When Florida learned that Virginia tight end Jake McGee was set to transfer into the program, the offensive coaching staff – and head coach Will Muschamp – rejoiced. The Gators were in dire need of a sure-handed, pass-catching, play-making tight end and got one that was able to join the program in the offseason and become a reliable target for redshirt junior quarterback Jeff Driskel. Unfortunately for the player and team, McGee broke the tibia and fibula in his right leg two quarters into his first game at UF and missed the remainder of the season. McGee, who was hoping to work his way into a second-day grade for the 2015 NFL Draft in his one year at Florida, suddenly found himself with a tough decision to make. Rehabilitate and go straight to the pros, potentially falling late in the draft or out of it completely, or return to school and try to do in 2015 what he was unable to accomplish in 2014. McGee receiving a sixth year of eligibility is no sure thing, however, as the NCAA will first review his waiver and decide whether to award him the extra season. It will likely be given to McGee if he took his freshman-year redshirt at Virginia for medical reasons; if not, it will be more difficult to get a sixth year approved. The Gators failed to get a sixth season approved years ago under similar circumstances for former defensive back Dorian Munroe, though the difference here is that McGee was injured in his final season and was not even able to play a single full game after transferring from Virginia to Florida. Most coaches – in any sport – hope to be the man in charge at some point in their careers. Durkin is finally getting his chance, albeit on an interim basis, but is also int he unique position of being out of a job once his task of leading the team is completed on Jan. 3. Asked about the situation on Thursday, Durkin would not say he felt “awkward” about the position he’s in but rather that it just comes with the territory. On Tuesday, rumors began to surface that Durkin had interviewed with Texas A&M and North Carolina for their open defensive coordinator positions. A source told OnlyGators.com that there is no mutual interest in the UNC job, but TAMU is very much in play for Durkin. Another outlet has reported that a deal with the Aggies may come sooner than later. “I have not accepted any sort of job anywhere, here or anywhere else other than the job as interim coach for the bowl game,” explained Durkin. Durkin also noted that he has spoken with some of his colleagues about his unique position and future opportunities, though he would not disclose whom he spoke with or what specifically was said during those private conversations. As he noted he would during his introductory press conference, new head coach Jim McElwain has been observing bowl practices, keeping a watchful eye on assistants he is considering asking to stay and assessing players that he is trying to place in roles ahead of next season. McElwain’s evaluations are just one of many motivating factors for Florida’s players as they prepare for the Birmingham Bowl. Durkin said Thursday that his message to the team has been to find a motivation – any motivation – to not only gear up for the game on Jan. 3 but keep them going throughout their football careers. “There’s a million different motivations, and that’s fine, just be motivated. Be a guy that’s motivated at practice, motivated to go play,” he said. » Durkin will call the defensive plays in the bowl game. Good to hear McGee wants to come back next year. Not so good to hear the NCAA will probably say no, it has been documented that his redshirt freshman season was not for medical reasons. It must be really distracting for Durkin to keep coaching the team while looking for a job at the same time. Having Big Mac watching practice must be a great motivator for our guys except those who are not coming back next year. Hope they give it their all as well. I don’t expect Florida to be very focused for the bowl game, let alone win it. Kelvin Taylor was quoted yesterday as saying something about “we’re going to go have fun and beat those guys up”. Yeah ok. Meanwhile East Carolina, 8-4 with a Senior QB putting up record numbers no less, are pissed coming off a last second fluke loss to UCF for the conference title. UF should be able to find a tight end, even if McGee doesn’t play. Uf signed three last year and have two committed this year. You should be able to find someone from five people. Don’t like our chances. Seen this movie a couple times In my life. 1989 and 05 . New coaches coming in.. ECU will lay it on us I’m afraid.